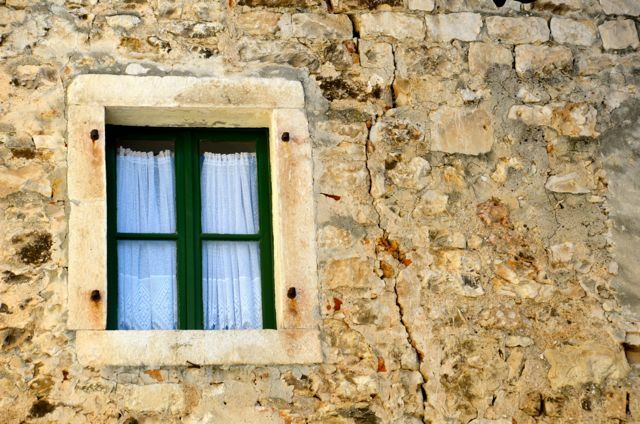 Our time in Trogir, Croatia is rapidly ticking down, and we are getting sentimental about leaving this special corner of the world that we have called home for the past seven weeks. Today, we will be heading to Dubrovnik, the so called ‘pearl of the Adriatic,’ by bus. It is a bittersweet morning. There is so much that we will miss about Trogir – its choir of the bells on the hour, our morning walks to the nearby island of Čiovo, watching novice sailors test out their nautical skills on the sparkling Adriatic, the mischievous canines and felines, and architectural flourishes and nooks and crannies that have enlivened our childlike spirits. Most of all, though, we’ll miss the kind people who made our time here so special. 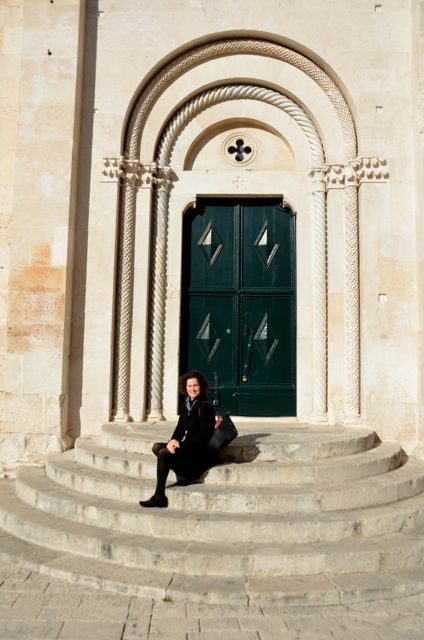 They taught us about Trogir’s incredible history, introduced us to Croatia’s wonderful wines and cuisine, took us out onto the Adriatic Sea, showed us how wild asparagus foraging is done, and taught us tidbits about the culture that we otherwise wouldn’t have learned. To these fantastic citizen diplomats we say hvala. 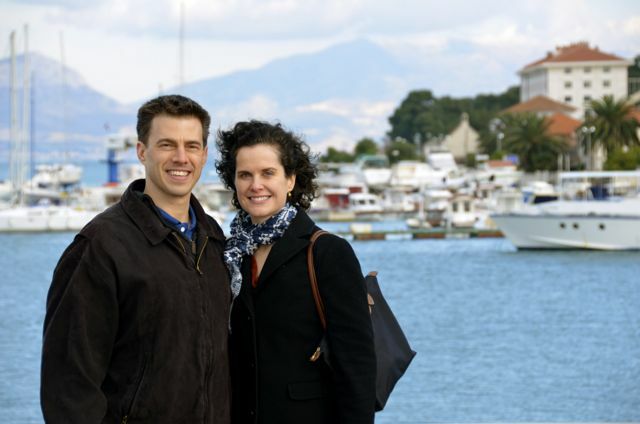 Thank you for making our time in Trogir so special. There are still many stories yet to be told from this charming Dalmatian spot, so we won’t be saying goodbye to Trogir for long. 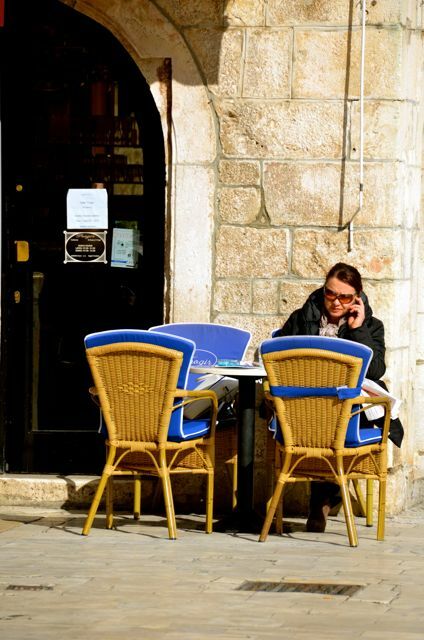 Until then, here are some more scenes of everyday life in Trogir. 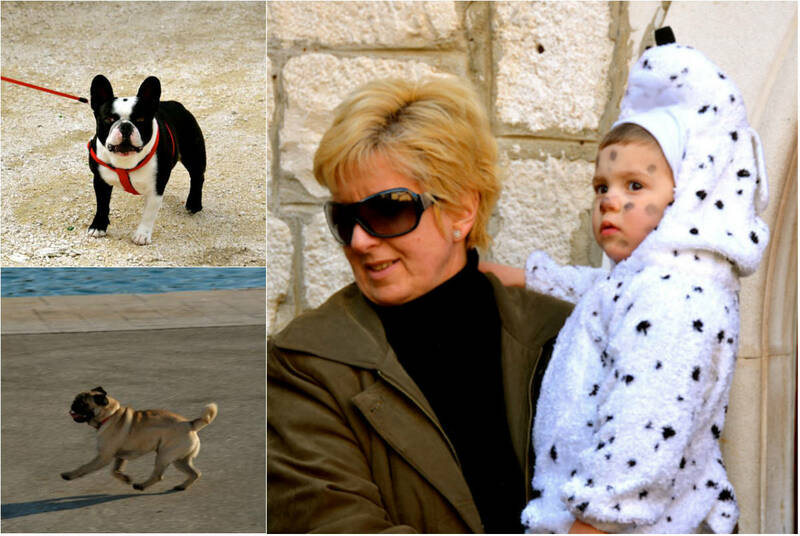 New friends in Trogir: Ummy the French Bulldog, Jacques the Pug and our first Dalmatian spotting, at a Carnival parade. The Dalmatian breed is said to originate in this region of Croatia. Spring improvements on a boat along the Riva. Easter Greetings for you. 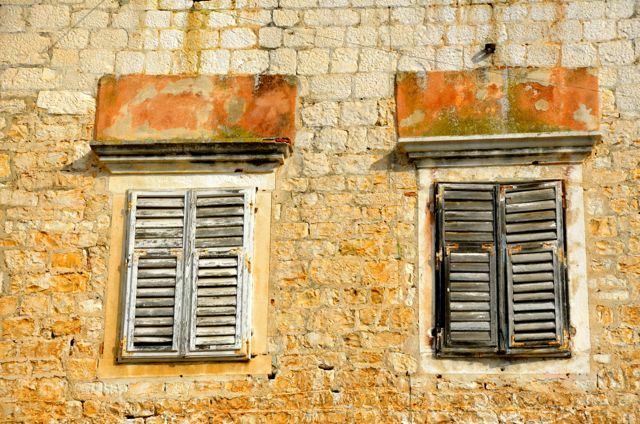 Thanks for sharing the vibrant Croatian moments. Thank you for the Easter wishes. How did you celebrate? It’s been a pleasure sharing our tales from this special corner of the world. 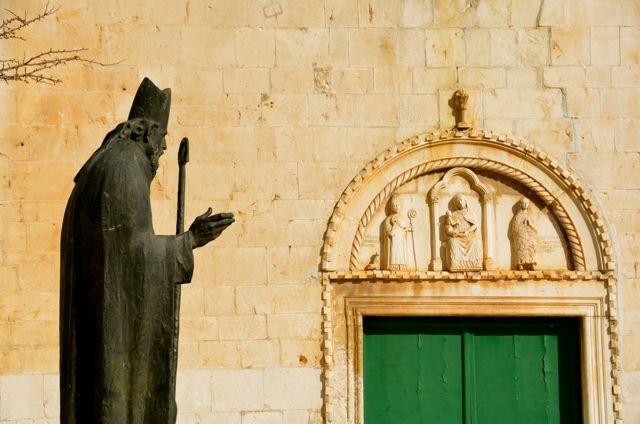 Even though we’ve left Trogir, we’ll have more to come – from Dubrovnik and beyond. 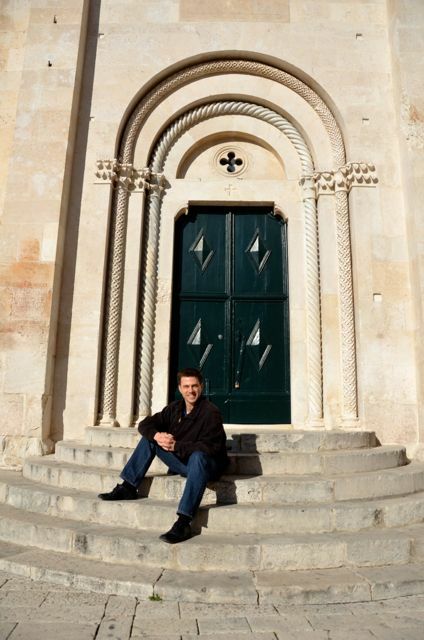 Have you been to the Balkans? Our weather’s been the same here as well. Here’s hoping spring is just around the corner! It’s a pleasure to share my tales from this beautiful part of the world. I hope you’ll be making it here someday soon. It’s well worth the wait. Would love to hear from you when you reach my area. We’ve actually just arrived to Dubrovnik, but since the weather is so grey and rainy today, we’ll have to delay our excursions in town by a day. We’re staying inside today, working. Perhaps we can meet up for coffee one of these days? That would be fun. Contact me directly, there is an option on my blog. Doubt you will be out much tomorrow as weather probably will be the same as today. Walk the wall and ride the cable car for views. Here’s keeping our fingers crossed that tomorrow gets better. I’m seeing conflicting weather reports but will follow the more optimistic of the two! 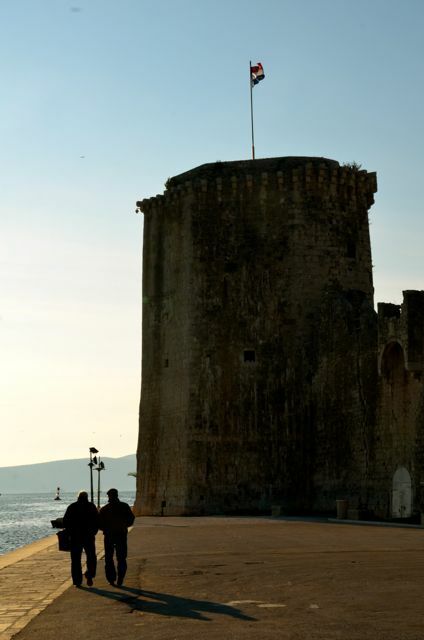 A beautiful tribute to Trogir, Tricia. I especially like the first collage you posted on this page…love the colors! 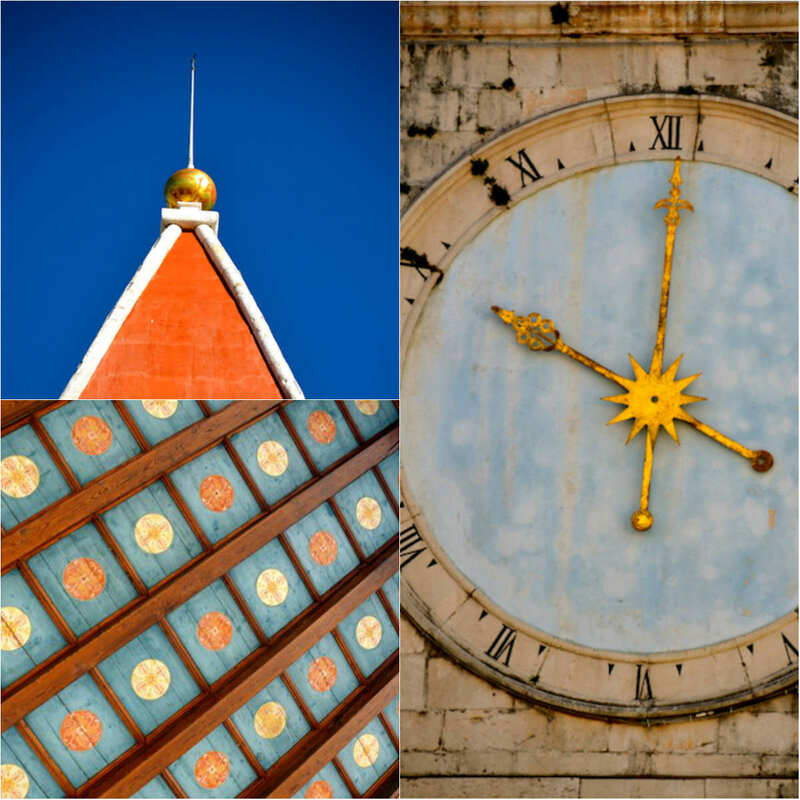 Thank you, Ruth – those shots were all snapped in Trogir’s main square: its loggia’s colorful ceiling, the belltower roof, and the clocktower on the loggia. I love all the details to be found in the Old World! Fran and Dave, our new friend raves about how special it is to explore the islands here by sailboat. Yesterday, he took us to a high point midway between Trogir and Dubrovnik that overlooks the Adriatic. 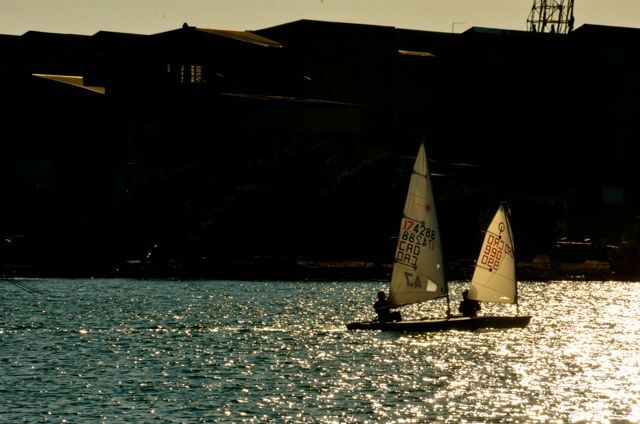 Seeing the islands out there can easily give one wanderlust to go sailing! Perhaps we will see you this summer (we’d love to!). I’ll respond to your Facebook message shortly. 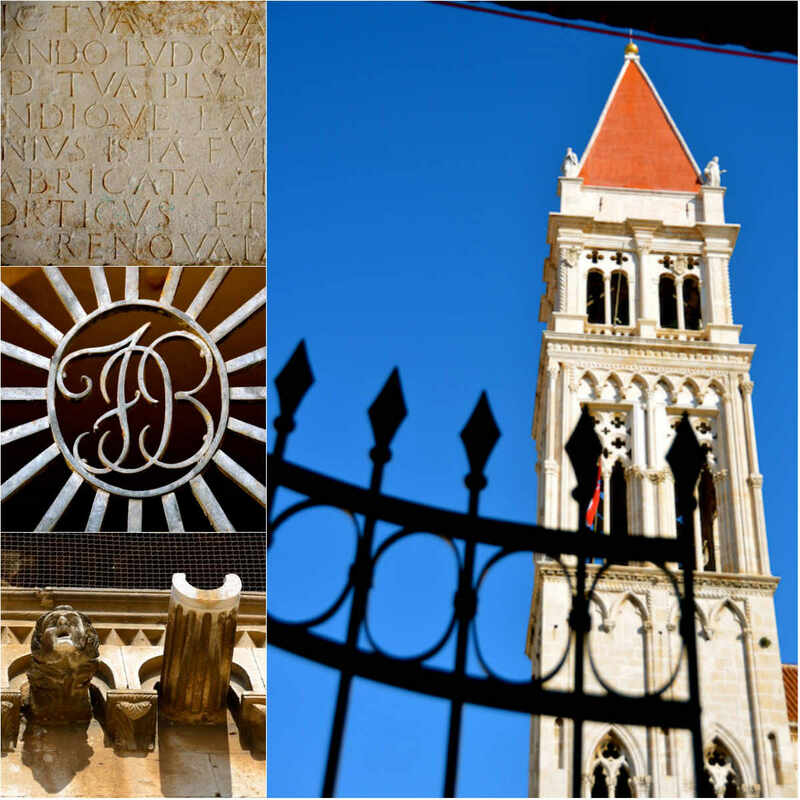 Great pictures – thanks for the memories of Trogir through your posts! 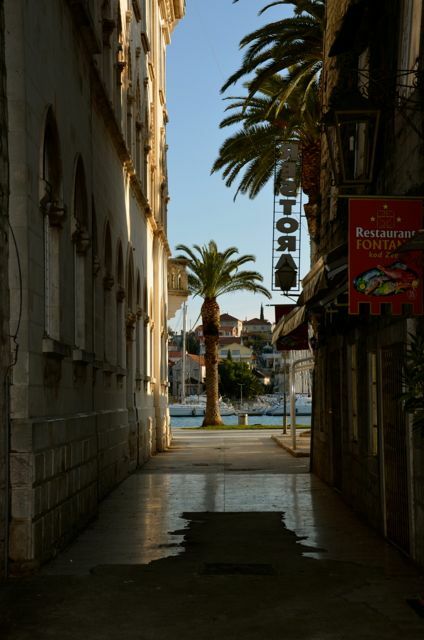 I’m finding myself saying “don’t go” too, Tricia- I’ve enjoyed your photos of Trogir so much. Bet you won’t miss climbing that bell tower though! Thank you. The post seemed a fitting way to say goodbye to a city that has become so special to us. 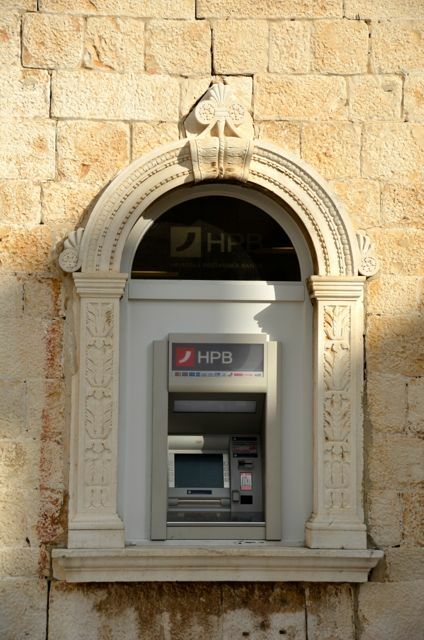 Your pictures portray a place steeped in history, tradition and seemingly open to newcomers. I have enjoyed your stories of this region. Really makes me want to visit. Oh Lynne, I hope you do! The people are so friendly and the hospitality is quite something. Yesterday, while en route to Dubrovnik, new friends that we’d met in Trogir insisted that we meet them at their weekend home midway between the two cities. We were rewarded with a delicious, all-natural meal, good conversation, and beautiful views of the Adriatic from their restored stone home. What a wonderful place for their kids to play, among Mother Nature’s splendor. Though we were excited to see Dubrovnik, we didn’t want to leave. Cornelia, it’s nice that you could join me for our chapter in Trogir. 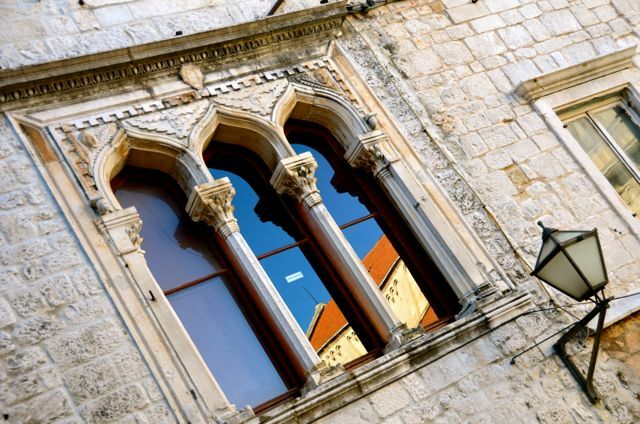 I’ve really enjoyed reading your anecdotes about visiting Dalmatia as a child! We are now in Dubrovnik, taking a coastal bus ride to get here last night. The weather has been quite rainy and grey – something that has the locals quite frustrated. They’re accustomed to more sunshine this time of year. My fingers are crossed. Perhaps someday you’ll make it to this part of the world, Valerie? There are so many unknown towns just waiting to be explored. 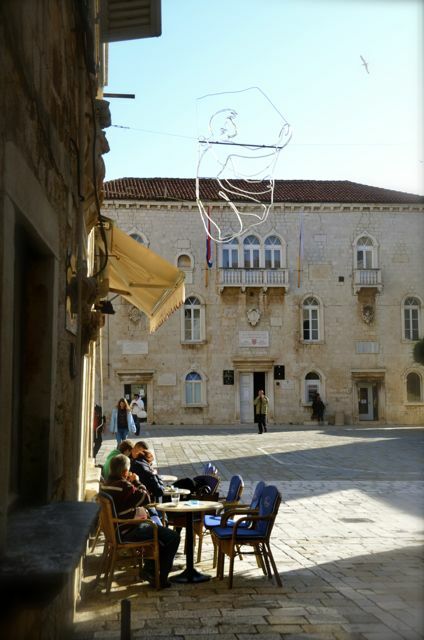 You’re right – the light in Trogir is quite special! Though as a Midwesterner who’s lived in Germany much of her life (= cold, grey winters) I have found spring here pretty nice, the locals said it’s the worst they’ve seen in years. “So much rain!,” they exclaim. Magnificent images. 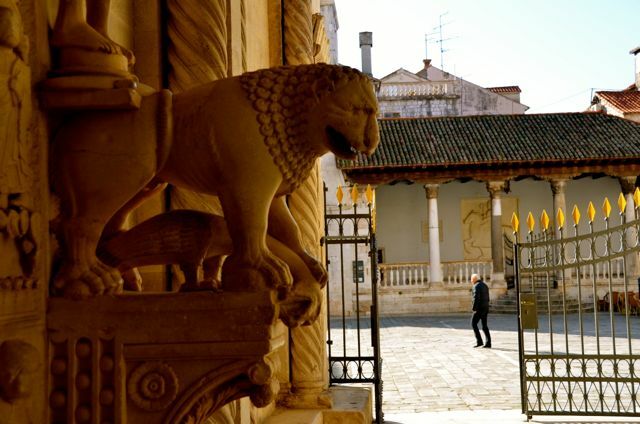 I was sentimentally attracted to the lion and the dragon of Venice! I can see why, Vera. This region has such a fascinating history, given its former ties with Venice and other countries. We were told that when the lion is accompanied by an open book, that it indicates a time of peace, whereas a closed one indicates a time of war. Have you heard this too? No I did not know that. I though that the book related to the gospel of St.Mark, patron saint of Venice, but symbols abounded in those days as “celebrities” do today. v.
Since you spent a bit of time here, can you recommend any favorite off-the-beaten-path spots or excursions? There’s been a deluge of rain here since we’ve arrived (something the locals said is so abnormal) but we’re hoping to get out tomorrow or Friday to ride the Dubrovnik cable car and walk the old city walls. James, thanks for these Dubrovnik pointers! We walked some of the residential streets yesterday, in the vicinity of what you described. Charming indeed. We had a simple picnic under a string of laundry that was drying overhead, then set off for our 3.5 hour walk of the walls. Shawn went jogging up in the first area that you described, while I stayed in our apartment and did yoga. He said I must return with him though, because it’s also quite pretty. So much to see! If we get the energy (and have enough time today) we thought it’d be fun to hike Mount Srdj. Heard that takes about 90 minutes. Virginia, that’s really thoughtful of you – I’m flattered! :) Thank you. Also, wanted you to know that I’ve been using the French Flashcards and enjoying them. Thanks again. No problem at all! And that’s great – I’m glad to have been of help! Thanks for sharing that!! This is my birthplace and I miss it so much – living in Chicago for many years. 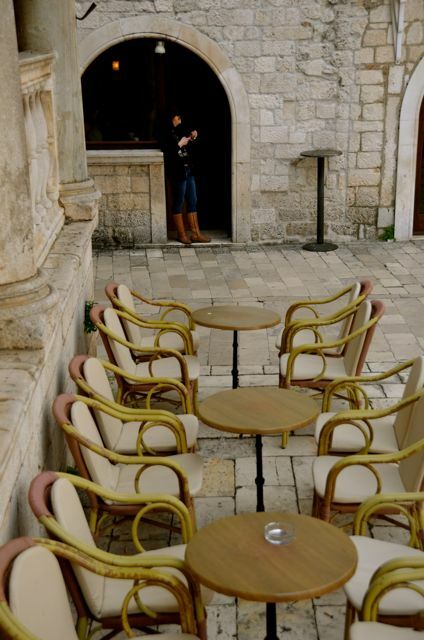 Always enjoy people discovering Trogir – there is a wonderful vibe there and most everyone gets it sooner or later. Cheers and enjoy your time in Dubrovnik! 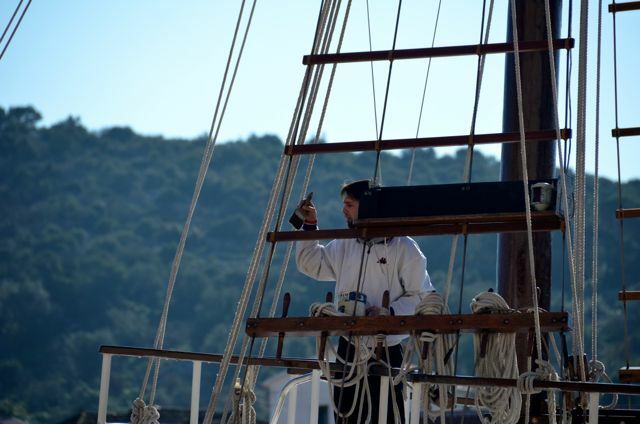 Mljet is a wonderful excursion for you – one of my favorite places in Croatia. 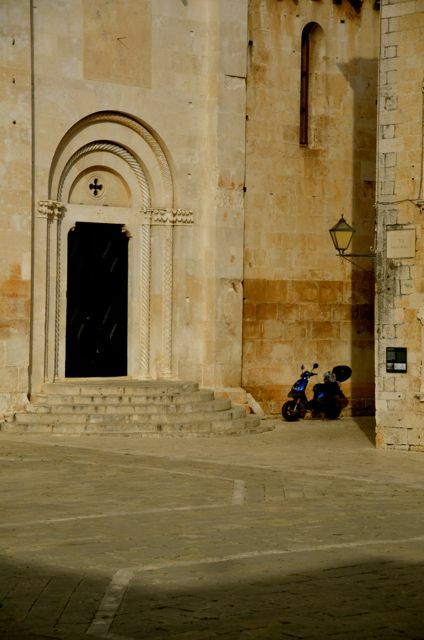 Zoran, such lovely pictures you have of Trogir; you have a great eye for photography. I like the ones of the loggia and the little one enjoying ice cream there, plus the back alleyway with the artwork, and Split. I understand why you miss home. What do you think of the Windy City? I grew up about 3.5 hours from there. That’s sweet of you to say, Bashar. We are quite happy here, though I must divulge that I was masking some fear that I had standing on that bridge (initially). It’s a drawbridge style, and whenever large vehicles drive over its joints, it shakes madly! We met a nice couple from Norway/the Philippines there and talked for about 30 minutes, standing on that dancing bridge. They were nice enough to snap this shot. These are so beautiful! It must have been lovely to live there, it looks so charming. Thank you, Jessica. 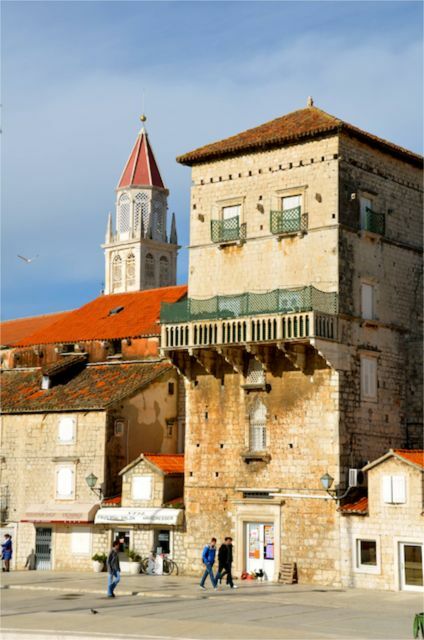 We were quite fortunate to call Trogir home for 7 weeks. For how much longer will you be in Spain? We hope to visit Croatia next year, so I am looking forward to learning from your adventures! I’m surprised that many of the spots we’ve visited here don’t seem to be on the radar much, because they have much to offer. 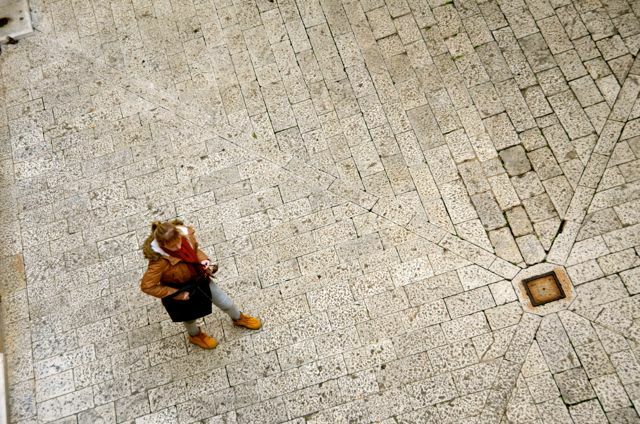 What spots are you hoping to visit in Croatia? Are you still living in Prague now? That’s one of my favorite European cities, due to its beautiful architecture and a special connection with a family friend who was born there in 1900.